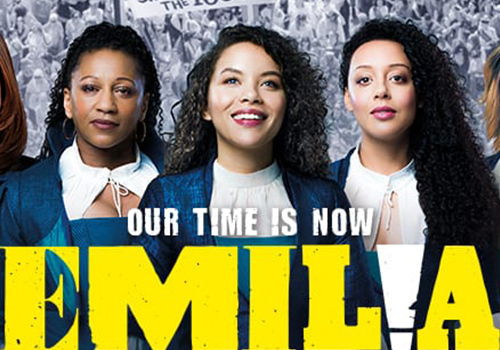 Shakespeare’s Globe’s acclaimed play Emilia transfers to London’s West End, playing at the Vaudeville Theatre from March 2019. Written by Morgan Lloyd Malcom, directed by Nicole Charles, and starring an all-female cast, this show will leave you feeling inspired and united. The Maly Drama Theatre of St. Petersburg return to London after an acclaimed West End season at the Theatre Royal Haymarket last year. 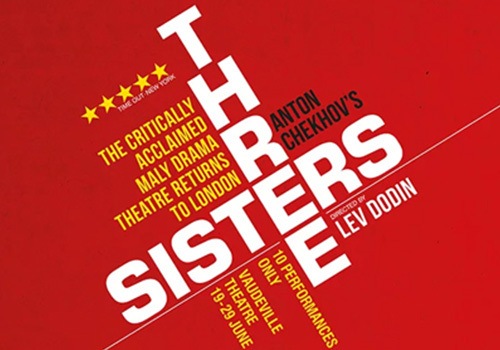 In June, they will present their retelling of Chekhov’s Three Sisters. Jill Murphy's beloved children's book series The Worst Witch is adapted into an action-packed stage show full of original songs, music, magic, and plenty of mischief. Adapted by Emma Reeves, the show follows accident-prone witch Mildred Hubble as she enters her final year at the school for witches. 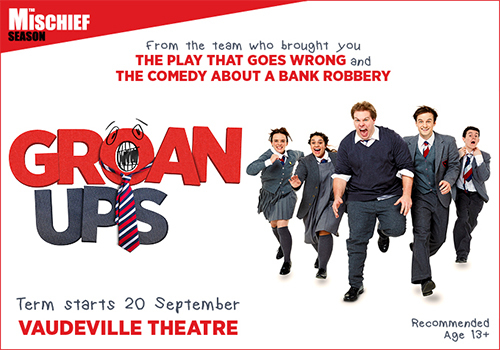 The show runs at the Vaudeville Theatre London from 24th July - 8th September. Are we the same person at 30 as we are at 13? Playing a classroom full of kids and anarchic high school teens, the hilarious Mischief Theatre (The Play That Goes Wrong) are back with their first new play since 2016 at the Vaudeville Theatre. 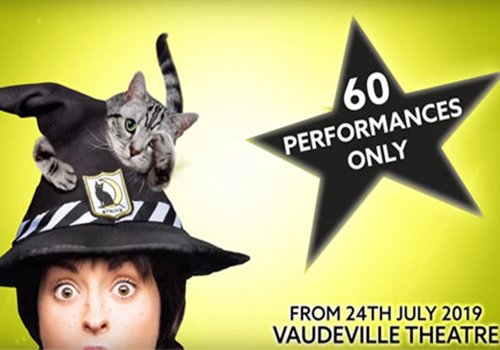 Mischief Theatre are back to pull off a grand illusion in their second show of their residency at the West End’s Vaudeville Theatre. Magic Goes Wrong sees a group of magicians put on a magic show for charity – but everything seems to be going wrong! 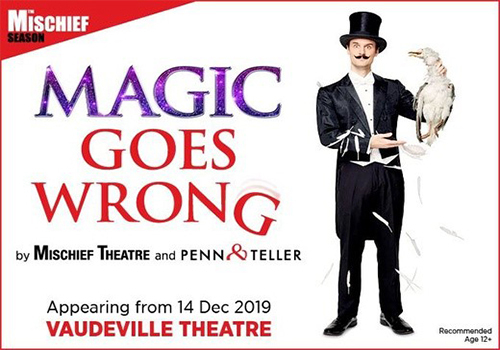 Created alongside magic legends Penn and Teller, get ready to cry with laughter at this brand new show from the makers of The Play That Goes Wrong! The Vaudeville Theatre box office is located within the theatre building on the Strand and is open from 10am to 8pm Monday to Saturday. Tickets can be collected from the theatre on the day of the performance during the hour before the show starts. When collecting pre-paid tickets you will need to bring the card with which you made the purchase as well as your booking reference. Designed by theatre architect CJ Phipps, the Vaudeville Theatre first opened in 1870 with comedy For Love and Money and burlesque act Don Carlos or the Infante in Arms. The theatre’s opening year also saw Henry Irving achieve commercial success in James Albery’s Two Roses, which ran at the venue for 300 performances. Subsequent successful productions included comedy Our Boys (1875), which ran for 500 shows. In 1889, Thomas Thorne demolished the houses behind the venue in order to expand the building. It reopened in 1891 with Woodbarrow Farm, followed by a revival of Our Boys (1892), The French Maid (1898) and Bluebell in Fairyland (1901). The 20th century saw comedies and musicals performed including J.M. Barrie’s Quality Street (1902), The Cherry Girl (1903), The Catch of the Season (1904), The Belle of Mayfair (1906), The Girl in the Train (1910) and Baby Mine (1911). Throughout the First World War, a variety of musical revues and light entertainment took place, before the building closed in 1925. The Vaudeville reopened in 1926 after refurbishment, with a revue show called R.S.V.P., followed by The Bread-Winner (1930). Record-breaking musical Salad Days transferred to the venue in the late 1950’s, conceded by Chips with Everything (1959). Later productions included The Bride Comes Back (1960), Shout for Life (1963), Arsenic and Old Lace (1966), Ray Cooney’s Move Over Mrs Markham (1971), Out on a Limb (1976), Noel Coward’s Present Laughter (1981) and Blithe Spirit (1986), Shirley Valentine (1988) and Kander and Ebb’s musical 70, Girls, 70 (1991). A successful revival of Salad Days played at the venue in 1996, followed by Macaulay Culkin in Madame Melville (2000), Ray Cooney’s Caught in the Net (2001) and Stomp (2002-2007), which later transferred to the Ambassadors Theatre. Subsequent shows included Swimming with Sharks (2007-2008), The Importance of Being Earnest (2008), starring Penelope Keith and The Deep Blue Sea (2008). By this time, the theatre had become renowned for a quick turnover of plays and comedies, with notable productions including The Female of the Species (2008), Piaf (2008-2009), Woman in Mind (2009), starring Janie Dee, Duet for One (2009), starring Juliet Stevenson, The Rise and Fall of Little Voice (2009-2010) and many short-running stints from comedians and entertainers. 2010 saw a variety of productions, including Private Lives, starring Kim Cattrall, The Prisoner of Second Avenue and An Ideal Husband, starring Samantha Bond. 2011 featured In a Forest, Dark and Deep, Broken Glass, starring Anthony Sher, Swallows and Amazons and Master Class (2012). Joe Orton’s What the Butler Saw (2012) played, starring Omid Djalili, followed by Anna Friel in Uncle Vanya (2012), Great Expectations (2013), The Ladykillers (2013), The Duck House (2013-2014), starring Ben Miller, Handbagged (2014), Forbidden Broadway (2014), The Wind in the Willows (2014-2015), Di and Viv and Rose (2015), starring Tamzin Outhwaite, Samantha Spiro and Jenna Russell and Oppenheimer (2015). David Suchet famously appeared in The Importance of Being Earnest in 2015, with Dawn French’s popular autobiographical comedy 30 Million Minutes following. Bill Bailey then performed his tour Limbo Land (2015-2016), which was conceded by Broadway comedy Hand to God (2016), starring Janie Dee and Harry Melling. 2016 also saw a lukewarm revival of Hobson’s Choice, starring Martin Shaw, David Baddiel’s hit comedy My Family: Not the Sitcom and Dead Funny, with Steve Pemberton and Katherine Parkinson. 2017 saw a short stint from comedy Boys in the Band, starring Mark Gatiss, and a revival of comedy Stepping Out, starring Amanda Holden and Tracy-Ann Oberman. Further productions include an adaptation of Lewis Carroll's beloved poem The Hunting of the Snark as well as transfer of The Mentor from the Theatre Royal Bath, starring F. Murray Abraham. The end of 2017 and beginning of 2018 sees Dominic Dromgoole embark on a year-long residency, presenting some of Oscar Wilde's greatest plays, including A Woman of No Importance, starring Eve Best, and Lady Windermere's Fan, starring Samantha Spiro and Jennifer Saunders. Tall Stories also brought their adaptation of Wilde Creatures to the Vaudeville Theatre. The Oscar Wilde season continues into 2018, featuring productions of The Selfish Giant, An Ideal Husband and The Importance of Being Earnest. After two short stints from comedians James Acaster and Mo Gilligan, the year rounds off with thriller True West, starring Kit Harington and Johnny Flynn. In 2019, Shakespeare's Globe's critically-acclaimed show Emilia will grace the stage, starting performances on International Women's Day (8th March). In the summer, a new stage adaptation of children's classic The Worst Witch plays. In September, West End favourite Mischief Theatre begins their year-long residency of three shows at the theatre. The first is school-based comedy Groan Ups, followed by Magic Goes Wrong in December.